In the minds of many moderns, the horrors of the 20th century represent far off events wholly detached from our present understanding of the world. They belong in the same mental compartment as the destruction of Jerusalem in 70 AD or the barbarian pillages of Rome. As an icon of evil, Hitler is roughly in the same category as Attila the Hun, representing an extreme and singular perturbation of history, with no cause and no effects, and no relevance to the present day. As of this writing, however, the 20th century concluded only thirteen years ago. Let that sink in. It was not some far off event. It was practically just yesterday. The Third Reich concluded ignominiously, even if drenched in the blood of millions, just seventy years ago. This will be within the lifetime of many readers. There may even be those alive who remember it; certainly, there are still many who heard of it not in history books, but out of the mouths of parents and grandparents, from those who endured it first-hand, and may indeed have been a part of toppling it. Perhaps because of its staggering scale, there is reluctance to look upon the last century with the kind of scrutiny it requires. Yet it is precisely because of that scale that we must make sure that we learn from it. To begin with, we must face up to the fact that the atrocities of the 20th century did not spring up out of the universe as historical accidents. They followed from particular events in human history that paralleled the emergence and dominance of particular philosophies. Some of these philosophies have become dominant once again. The bloodbath that was the 20th century did have causes and contributing factors. The book you have in your hand right now is one of them, but modern readers may have trouble fathoming why on earth that should be the case. Except for some occasionally jarring language to our modern sensibilities, most of Binding and Hoche’s arguments are within the mainstream of today’s ‘ethical’ thought. And what is there to object to? After all, can’t we all agree that a person facing a future of perpetual, intense suffering, is facing a life that is not worth living? Only a heartless and cruel person could possibly stand in the way of allowing that person a quiet, dignified, and humane release. Right? On top of that, considering the fact that there are scarce medical resources available, society has a duty and obligation to ensure that those resources are allocated towards those who can expect a good quality of life. Right? Perhaps the reader doesn’t appreciate that characterization of the issue, but it is in fact the kind of language and argumentation being advanced in health care today. Documenting it is outside the scope of this essay, but for a treatment specifically on the topic, turn to Wesley J. Smith’s Culture of Death: The Assault on Medical Ethics in America. 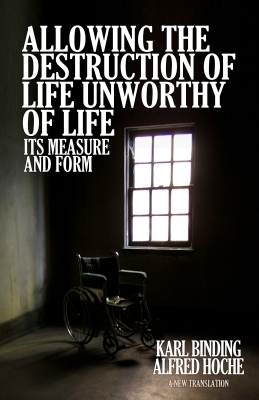 It has an entire chapter titled “Life Unworthy of Life” that draws the connection making specific reference to the present book by Binding and Hoche. The purpose of this essay is different. Not everyone finds the information that Mr. Smith has documented to be all that disconcerting—obviously, since there must be people out there actually saying and doing those things in order for him to document them. Indeed, many find the ideas more or less acceptable. That they happened to be latched onto by the National Socialists is unfortunate, but that doesn’t necessarily discredit them, does it? Those ideas don’t necessarily have to lead to a holocaust, do they? For the purpose of this essay, we will suppose that such a thing is hypothetically possible, but it must be strongly stated that if that is to be the case, then it can only be the case if the right lessons are actually drawn from recent history. As will be argued, it is highly doubtful that this is what has happened. Lessons have been drawn, but they are the wrong ones. In the handful of contemporary examples that illustrate this, we will touch on what some of those lessons are, but that also is not the purpose of this essay. To even begin drawing the right lessons, we have to ask ourselves how it was that something as ‘innocuous’ as Binding and Hoche’s Allowing the Destruction of Life Unworthy of Life could serve as a catalyst for some of humanity’s worst atrocities. There are reasons why that was the case, and it is to those reasons we turn to now. It is to the reader to connect the dots after that. Few people today realize that the Nazis, communists, fascists, and Marxists that carried out the atrocities of the 20th century all believed that A., they were good people and B., they were acting on scientific principles. Insofar as it is recognized, their schemes and operating principles are now regarded as ‘pseudo-scientific.’ Naturally, the people at the time did not view it as pseudo at all. Whether or not present day attitudes on what we regard as ‘scientific’ will be labeled as ‘pseudo-scientific’ in fifty years remains to be seen. Fish do not know they are wet. It would seem that the Nazi premise remains sound, they just didn’t have their facts right. In framing it in this way, we now have a glimpse into how Binding and Hoche’s work could have morphed into the horrors that it did. When one is talking poppycock about religion and ethics, one is in the domain of mere opinion. When one is talking about science, one is talking about the world as it really is. It is not the sort of thing to get squeamish about. It is this notion that certain conclusions follow self-evidently from scientific ‘truths’ that lies behind the 20th century global eugenics movement. The same notion drove on the Marxists and the Nazis. The same unspoken presumption is with us today, unnoticed, and therefore not repudiated. Clearly, though, that notion is not enough to get us from this document to the Holocaust. To understand how even-handed the Nazis were in this outlook, it is important to recall that before there were extermination camps, there was the T4 program. In the T4 program, disabled Germans of all ages were rounded up and quietly gassed. Read that again: these were Germans. Even former German war heroes were not safe from Germany’s public ‘health’ policies—for that is what they were seen as: public health policies. The racial component is important in understanding the Holocaust but it cannot be seen as the root cause. The National Socialists had in view all who were biologically inferior. “National Socialism is applied biology,” after all. This viewpoint is central in explaining how Binding and Hoche’s work served as such an important catalyst, but to understand why it must be put into greater context. For that, it is necessary to at least make mention of the so-called “Age of Enlightenment.” In Germany, this culminated with Nietzsche’s proclamation that ‘God was dead.’ No longer held back by “religious beliefs, sentimental feelings and so on,” the Germans, as with like-minded individuals in the United States and elsewhere in Europe, citizens were busily constructing new moralities based on new scientific facts. The 1800s was a century of optimism. Then there was the opposite view of the Church, which held that all people were made in the image of God, with their own intrinsic value. In England, slavery was abolished by Christians who believed that proposition with their whole being. In America, the Church was more complicit in the slave trade, but even there the sentiment against it was high and hostile. There was, after all, a civil war over the matter. But religion consists exclusively of opinions, and have even less authority than opinions normally do. Even so, whether it is the idea that humans are made in the image of God or just higher animals, they are just ideas that some people hold. They are not weighty enough to force your fellowman to fall in line with them. Then came Charles Darwin in 1859 who, in his On the Origin of Species by Means of Natural Selection, or the Preservation of Favoured Races in the Struggle for Life ended the dispute decisively, putting one set of opinions on the firm foundation of scientific fact—the Malthusian outlook—and disproving the religious one. At least, that was how it was instantly perceived—and is still perceived to this day. Darwin’s evolutionary theory soon was firmly accepted within the scientific establishment and the implications were instantly grasped and acted on. Men like Francis Galton began openly discussing the need for ‘eugenics’ programs of various kinds. In America, these and other proposals took on additional impetus due to the abolition of slavery after the civil war. Hundreds of thousands of freed slaves began to gravitate to the cities. Unable to fend for themselves, they were taxing public resources. They were ignorant, illiterate, feeble-minded idiots that obviously were biologically inferior compared to those of northern European stock. After Darwin, the prejudice and racism that had previously existed as mere sentiment became something new: scientific racism. It was now grounded in reality, as proved by science. Now it was possible to take actions based on the absolute conviction that one was not merely playing to their own sensitivities, but rather were acting in view of cold, hard, scientific fact. And if anyone had any doubts, they needed only look to the negroes. Nothing better illustrated the importance of quick and decisive application of biological principles. The mentally dead possess an intellectual level, which we first find at the very bottom of the animal chain, and also the emotions that they feel do not rise above the bar of the most elementary processes, which are associated with animal life. Therefore, a mentally dead person is also not capable of raising an inner subjective claim to life, just as poorly as he would be capable of other mental processes. This latter point only appears to be unnecessary; in truth, it has its meaning in the sense that the disposal of a mentally dead person does not equate to any other death. From a purely legal point of view, the destruction of a human life already never means the same. The distinction between humans and ‘animal life’ is not drawn very brightly, for Dr. Hoche. Not all deaths are the same. The ‘disposal’ of a mentally dead person—that is, someone exhibiting an intellect at the level we see among animals—is not the same kind of death as other deaths. Seen from the point of view of a higher civil morality, there is no doubt that exaggerations are being exercised in the striving for the absolute preservation of unworthy life. We have learned, from someone else’s point of view, to consider in this respect the state organism as a whole with its own laws and rights, in the same way as, for instance, it would be for a self-contained human organism, which, as us doctors know, surrenders and rejects individual parts or particles that have become worthless or damaged in the interest of the well-being of the whole. From an economic point of view, these complete retards, just as they meet from very early on all the prerequisites to be classified as fully mentally dead, they would also be at the same time those, whose existence weighs heaviest on society. The question of whether the necessary expenditure for these categories of cumbersome existence is justified at any cost, was not a pressing one in the past years of prosperity; now things are different, and we must seriously deal with it. Hoche said that “the state organism as a whole” had “its own laws and rights.” This sentiment was universally shared at the time and is common today. When Hitler and the National Socialists moved to purge Germany of the weak and burdensome just thirteen years later, they believed they were acting scientifically and with good intentions. They were merely operating at a level of “higher civil morality”, the plane of morality beyond the individual, the plane that manifests only at the level of the State, the state organism, and the species. This image will also later show itself in this cultural question of ours. There was a time, which we now view as barbaric, in which the disposal of those born with unlivable conditions was considered natural, and then came the still on-going phase, in which the preservation of any whatsoever worthless existence is ultimately considered the highest moral requirement; there will be a new time, which, from the point of view of a higher morality, will stop to constantly translate into action the demand of a wild humanity concept and an over-protection of the values of existence with heavy sacrifices. From the foregoing, the rough outlines of how Binding and Hoche’s book was so well-received in Germany should be clear, but it still doesn’t explain how it was that it was a catalyst. Karl Binding and Alfred Hoche were not Nazis. They were not National Socialists. They were academics. Binding was a well-regarded attorney and Hoche was an experienced doctor. But this is precisely why their views proved instrumental. It is because they were well-respected scholars giving their dispassionate, rational, judgment on whether or not it was ethical to ‘dispose’ of the ‘unworthy’ that their arguments had the weight it did. It was because they weren’t radical ideologues, but sober academics, that their positions were taken as seriously as they were. Moreover, who took their arguments seriously is critical to observe. It was the doctors, psychiatrists, and lawyers that implemented and designed the T4 program and later administrated the extermination camps. It is a myth that these operations were manned by SS thugs pulled out of the German beer halls, willy-nilly. In the words of one survivor of a German concentration camp, the doctors ran it all. Binding and Hoche would have been annoyed with the fact that their book would become linked with the Holocaust. They were just having ‘a conversation.’ Savulescu, likewise, chafes at the outrage inspired by his ideas or the forum he gives to similar ones. Two of his friends in academia, Alberto Giubilini and Francesca Minerva, published an article titled “After-birth abortion: why should the baby live” in Savulescu’s journal. Their argument is that a born child is not fundamentally different than an unborn child, so if we accept aborting an unborn child, we should not have any objection to aborting born children. This is offensive… but they are correct. Based on their notions of what people really are (just another kind of animal) and in what sense people have value (only insofar as society or the state assigns it), they are correct. So, if you accept those premises yourself but find yourself repulsed by their viewpoint, you have a problem. You are not being consistent. They are. But I digress… though only slightly. Here, in a publication from 2012, is a concise restatement of Binding and Hoche’s own arguments and approach. It is but a very small step from this to a state acting according to its own interests based on ‘laws and rights’ that manifest at the level of the state—setting aside the interests of the parents completely. The only difference with the Nazis is that they made that step. You see, says Savulescu, these ideas are not new. Singer, Tooley, Harris… and Binding and Hoche… have all made them as well. They are not being advocated, rather, they are merely providing sober conclusions from the facts. The ideas merely “proceed from premises which many people accept.” The scholars are not radical ideologues. They are well-respected academics merely participating in “the very values of a liberal society.” What could possibly go wrong? Savulescu, Giubilini, Minerva, and Appel do not imagine that their arguments and positions could possibly lead to any kind of atrocity a decade hence. For them, ideas are toys. They are playthings for intellectuals. They are not men and women of action. But men and women of action are everywhere. Like the aforementioned scholars, these men and women of action believe they are good people. In fact, we will assume they are. Our men and women of action do not see themselves as ‘bioethicists.’ Most consider these issues ‘above their pay grade.’ They are relying on people like Savulescu, etc, to find answers to these difficult questions for them, and are thankful for their efforts. Likewise, the scientists and medical professionals in Germany throughout the 1920s were thankful that Binding and Hoche did the heavy lifting for them. And why not? That’s why we have experts. That is the final ingredient that converted the academic musings of Allowing the Destruction of Life Unworthy of Life into one of history’s worst nightmares. Let us see if we can sum up some of the right lessons to draw from the horrors of the 20th century. 1. Deference to ‘experts,’ including deference by ‘experts’ to other ‘experts,’ is dangerous. Any such deference must be thoughtful and deliberative and not automatic. The power and authority of ‘experts’ must be subject to checks and balances like any other power and authority. 2. Allowing ethical considerations regarding life and death to be linked to the interests of the ‘social organism’ is dangerous. 3. Believing that there is one set of moral principles for the ‘individual’ and another set for the ‘social organism’ is dangerous. 4. Asserting that certain ethical considerations, behaviors, and attitudes flow directly from scientific data is dangerous. 5. Behaving as though ideas—even grotesque, inhuman, ideas—can be carefully considered for their relative merits as though they have no consequences or implications is dangerous. Now, in calling these things ‘dangerous,’ the purpose is not to dismiss them out of hand. Remember, we are leaving open the possibility that one really could have a conversation about, say, for example, killing born children just because they have a disability, without anyone actually trying to implement it in the real world—ever. What happened with Binding and Hoche’s work is that their ideas found an audience in a particular culture that was uniquely primed to embrace and implement them. Can we be so certain that ten years from now there will not be another similar society? Does it matter that our own culture has embraced these attitudes but our governments lack the ‘free hand’ that the National Socialists had in implementing them? That is, if these ideas are pervasive even now, does the fact that some modern democracies presently serve as a check against abuses provide any comfort, especially as various governments move to insulate themselves against those checks and balances? These questions are left for your consideration. The worst thing you could do is ignore them, for failing to learn the lessons of history, while not necessarily destining you to repeat them, certainly opens up the very real possibility that you could make them again, without even knowing you are doing it. The previous section began by implicating ‘science’ in the mass murder of millions of people. Certainly, the accusation is justified when we take into account that the people doing the murdering believed they were acting on scientific principles, regardless of our modern dismissal of their views as ‘pseudo-scientific.’ However, the accusation is not entirely fair (just as assigning blame to ‘religion’ is not fair). Since understanding how it is not fair can help us to not repeat the mistakes of the good intentioned 20th century men and women more than casually labeling their work as ‘pseudo-scientific’ would, it is worth touching on the topic. Simply stated: You cannot get an ought from an is. You cannot get from “This projectile is moving 500 feet per second” to “I am justified in directing that projectile into your body.” You cannot get from the invention of the atom bomb to the morality of deploying it from the physical facts concerning the atom bomb alone. Things and physical processes are morally and ethically neutral. The idea that evolutionary theory entailed certain conclusions and implications self-evidently was central to the calamities that followed. Real science is grounded in the empirically observable, repeatable, and falsifiable. Anything that is truly scientific in nature could never be parleyed into a justification for any behavior of any kind. For that, you need moral argumentation. No tyrant has ever begun with the observation that water boils at 212 degrees Fahrenheit and from that proceeded to justify executing someone. Eugenics conflated its understanding of evolutionary theory as rock solid scientific fact with intrinsic moral implications. Even granting that their understanding of evolutionary theory is accurate and comports with reality, moral implications do not necessarily follow. There is a problem with this analysis, though. Evolutionary theory is supposed to account for every aspect of the human being. Through natural selection, our brains and bodies and so on and so forth have changed over time resulting finally in the human species. If one jettisons God from this analysis—and most evolutionists believe one should—then even our moral behavior is the result of unguided (by definition!) selective processes over time. ‘Morality’ is an artifact, the result of physical processes as much as our ear lobes are. It is not the purpose of this essay to delve into this important issue, but it is worth pointing out that if someone studiously avoided drawing an ought from an is, they would never fall into the trap of thinking there could be anything such thing as ‘applied biology.’ The ethical dimensions would be understood to be something separate and distinct, and so evaluated separately. If our actions, attitudes, and mental activity is reduced to biological ‘stuff’ that distinction would be hard to make, but it is theoretically possible to make it. Whether or not an evolutionary worldview can justify making such a distinction is a topic for another day and is one more thing submitted for your consideration. Battle lines have developed around the horrors of the 20th century. Weinberg, you will recall, said it takes religion to make good people do evil things. There is a great effort to pin the Hitler and the Holocaust on Christians, and in the spirit of ‘ideas have consequences’, secular humanists have tried to argue that really, really, really bad things will happen if religious people are able to express their religious views within the public sphere—the Holocaust a case in point. Moreover, both Binding and Hoche exhibit contempt for Christianity’s historic defense of ‘lives unworthy of life’ and see their views as diametrically opposed. Binding regards the Church’s opposition to a ‘right to suicide’ as unchristian. He is pleased to report that this right has been “fully re-won […] apart from very few less evolved countries.” [emphasis added.] Hoche regards the time “in which the preservation of any whatsoever worthless existence is ultimately considered the highest moral requirement” as barbaric. Both Binding and Hoche believe that their even-handed approach to the issue has nothing whatsoever to do with religious beliefs. What Christians in the past had regarded as barbaric, Binding and Hoche endorse. What Binding and Hoche regard as barbaric, the Church embraced. What the National Socialists proceeded to do with Binding and Hoche’s rationales in mind they did dispassionately, without being encumbered by old, outdated, discarded doctrines about the sanctity of life. Whether or not religious elements, and even ones with Christian aspects, surfaced in other areas of the Third Reich, their killing programs were seen by them as part of their secular efforts. Not that Malthus was the first to put the notion out there. Jonathan Swift’s 1729 A Modest Proposal, which (satirically) suggested that poor Irish people solve their economic problems by selling their children off as food, was a response to other kinds of proposals then common, which he felt were just as evil and absurd. Darwin actually credits Malthus as being an important influence on his thinking. What Darwin added to the Malthusian outlook was the idea that in the competition for scarce resources, some parts of the population would die, leaving only the stronger parts. In this way, death was actually a vehicle by which a population was improved. ‘Natural Selection’ was a creative power; indeed, it was the explanation for how all life came to be. It was Galton, Darwin’s cousin, who coined the word ‘eugenics’ in 1883. He thought that Eugenics “must be introduced into the national conscience, like a new religion. It has, indeed, strong claims to become an orthodox religious, tenet of the future, for eugenics co-operate with the workings of nature by securing that humanity shall be represented by the fittest races. What nature does blindly, slowly, and ruthlessly, man may do providently, quickly, and kindly.” From an address to the Sociological Society in 1904 titled Eugenics: Its Definition, Scope, and Aims. This is not an assessment about what Darwinism logically entails, but rather a simple recounting of the actual developments according to the record of history. According to the words of one concentration camp prisoner-doctor, as recorded in Robert Jay Clifton’s The Nazi Doctors, “[Doctors] managed the situation… at the infirmary… selections,… at the station… the crematoria… They were everywhere.” pg 202. Binding more explicitly than Hoche, but realize that Hoche felt that the mentally retarded were on the level of the animals, for whom no ‘consent’ was possible, and therefore not really relevant. Disabled children, such as children with Down Syndrome. My characterization; Appel of course doesn’t use the phrase, but the meaning is more or less the same. Jacob Appel, Neonatal Euthanasia: Why Require Parental Consent? Bioethical Inquiry (2009). I hope by now it is realized that the Holocaust is not by any means the only atrocity referred to and Nazism the only place where the ideas under examination were, and are, held. For example, in Britain, with the Liverpool Care Pathway, or in the United States with the coming implementation of the Independent Payment Advisory Board, which will have the power to decide who gets what care, based on the standards that it alone is able to set and consider. Francis Collins is an avowed evolutionist who disdains Intelligent Design and Creationism who nonetheless does not believe evolutionary theory properly accounts for morality. As a former head of the Human Genome Project, his credentials as an evolutionist are impeccable. However, he has persuaded few of his fellow evolutionists to his view. While he has become a Christian, most of his peers remain atheists.